Before I travel to Australia, many of my friends told me it is a very vegetarian/vegan-friendly country. 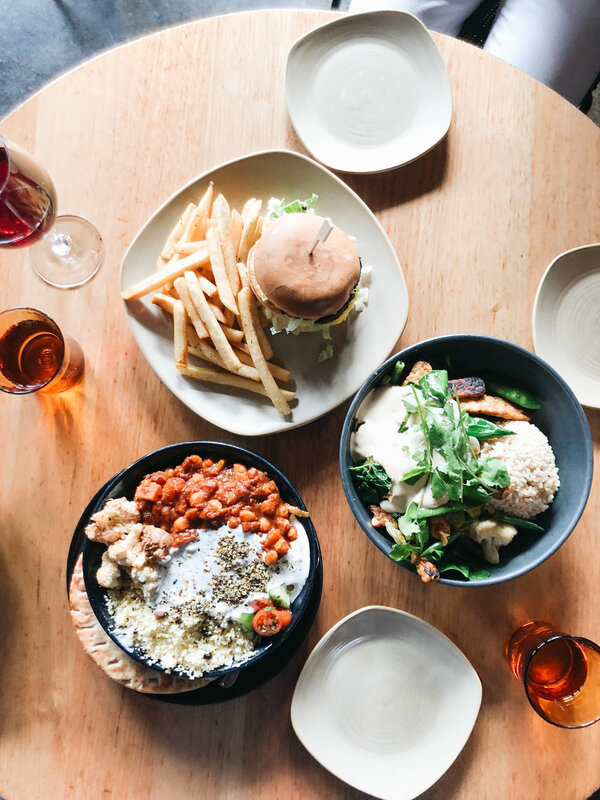 With a lot of options for plant-based diet, Here I would like to share two brunch places which I love the most in Melbourne! 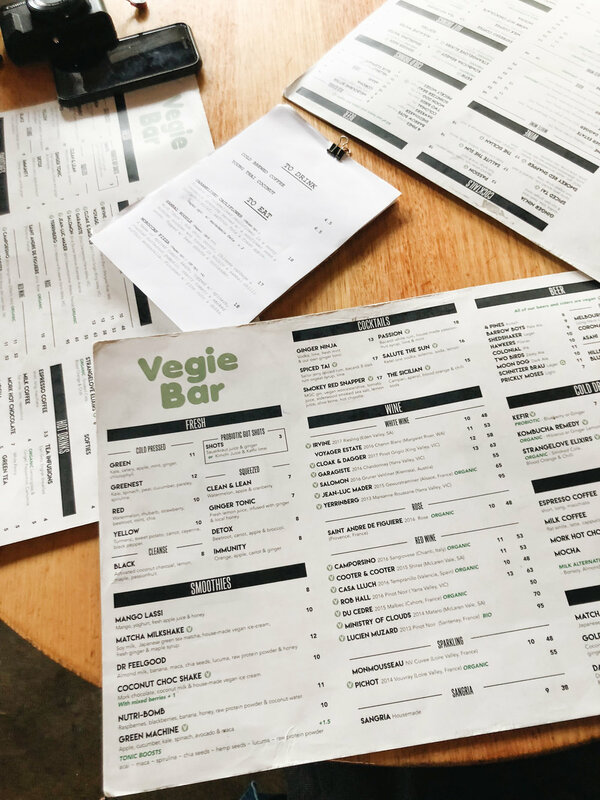 If you are into Western-Asian fusion food and being a fan of casual comfort food, Vegie Bar is definitely one of the good choices. Located near to the Rose Street Designer Market (a “must-visit” place for hand-crafted goods lovers!) and in the heart of hipster district “Fitzroy”, you can easily notice the restaurant when crossing the street. Raw and industrial style of the interior, friendly and young waiter/waitress, a laid-back atmosphere is created all over the house. The big restaurant also has a terrace area, perfect for breezy summer days. All the comfort food like burger, pizza, pasta and fries are available (Who doesn't love these food?! ); at the same time, they also serve some lighter or wholesome options like grain bowls, stir-fry greens and salad. Not to mention they have a list of vegetarian/vegan dessert - from brownies, “cheese” cake to raw cake, truly a paradise for the plant-based diet. A stir-fry of seasonal vegetables with organic tempeh served in a wok without sacrifice to flavour - it is actually very yummy with tamari, garlic and ginger taste! What is Tempeh? My previous article “3 Vegan Restaurants in Taipei” has recorded my 1st experience in trying it! Tempeh is an Indonesian dish made by deep-frying fermented soya beans. High in protein and a good meat substitute - it really does fill you up! We love to mix the tahini sauce (you can also choose satay sauce), together with the brown rice, the dish is full of different flavours. A middle-east inspired plate served in a wok with spiced tomato, baked chickpea and butternut pumpkin stew with roasted cauliflower. Topped with currant, almond, hazelnut and coconut flakes. Simply delicious when eating with the warm pita bread. 155 Fitzroy St,St Kilda, Victoria 3182. This lovely restaurant might be my favourite place during the trip. Being well-known for their breakfast and brunch, they make fresh and delicious food with vegetarian/vegan options. The portion is huge (I guess that is normal Aussie portion) without having to sacrifice the taste of it. If you are going with friends of different diets (meat/vegetarian/vegan/gluten-free), it is the place to visit! I ordered my "go-to" breakfast - Oat porridge. Cooked with warm quinoa, chia and rolled oat, the soft and creamy porridge is served with banana and berry compote. And topped the macadamia crumbles, simple, tasty, and very satisfying. My mum ordered asparagus with buffalo mozzarella, served with poached eggs, lemon almond houmous chia crips and bacon crumble - she likes the refreshing taste and guess what, this is a gluten-free dish. My brother had the fillet steak sandwiches on sourdough. With caramelised onions and beetroot remoulade to balance the taste. I guess this portion could feed two really hungry people… It is super huge! They also served a range of vegetarian cakes on the bar, with a selection of wines, coffee and tea. What I love about drinking Chai Tea in Australia - they always come with a full pot of goodness. A must try if you are a fan of CHAI! Let me know which restaurant you would love to try, and next articles I will share more about the cafe-hopping experience.